DESCRIPTION: Real Photo Stereoview Card, standard size, c1863 Franklin White back... Front shows Civil War Era group from Lancaster NH posing together near Tip Top House on Summit of Mt Washington NH, possibly on the occassion of Col. Ed Cross 5th NH Reg. Published by Franklin White Lancaster. Guaranteed vintage, not a reproduction. CONDITION: Very Good, minor wear, dulled corners, no creases, holes, chips, rips, repairs, or other damage. 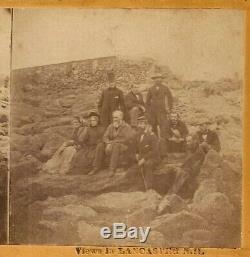 The item "1863 Civil War Photo Stereoview Card Lancaster NH Soldiers Mt Washington Summit" is in sale since Thursday, March 21, 2019. This item is in the category "Collectibles\Photographic Images\Vintage & Antique (Pre-1940)\Stereoviews". The seller is "cherryhillpc" and is located in Greenfield, New Hampshire.